Successfully Added Waterproof Bluetooth Speaker (Swimming Pool, Shower, Beach) to your Shopping Cart. Waterproof Bluetooth Speaker (Swimming Pool, Shower, Beach). The worlds first floating waterproof Bluetooth speaker! Finally, you can lay around in your swimming pool all day and never worry about missing a call because this floating Bluetooth speaker will be let you know! Simply pair this speaker with your cell phone and let it stream all your mobile phone's MP3 music, then when a call comes in the music will stop playing to let you know that you have a call coming in. Unique and useful, this Bluetooth speaker has a great feature set including; 2 x 2W speakers with 8Ohm impendence for clear stereo sound, Bluetooth A2DP/AVRCP native profiles, the use of standard AA batteries for always available power, and best of all it is totally waterproof! You can let this float next to you in your pool, play with it on the beach, or even take it into the shower with you - how you use your Bluetooth speaker is up to you!! This Bluetooth stereo speaker is the perfect accessory for getting the most sound output from your cellphone's music and making sure you never miss that important call. Available for single piece or stock quantities, order yours now! As always, this exciting new product is brought to you by the original factory direct no M.O.Q. (no minimum order quantity) wholesaler, Chinavasion. Waterproof Bluetooth Speaker for use in the swimming pool, shower, etc. 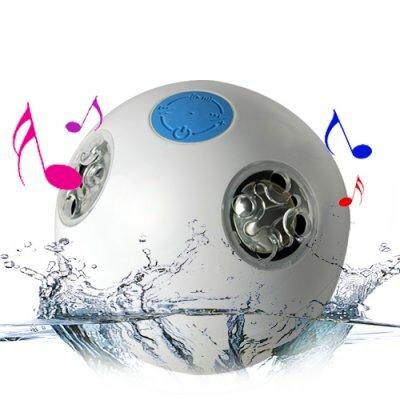 Works as a waterproof stereo speaker via Bluetooth A2DP - worlds first floating waterproof Bluetooth speaker! Pair with Bluetooth cellphone such as the iPhone or even Bluetooth capable computer to stream music while you are in the pool, bathtub, etc. WATERPROOF - Floats on the water, but is not submersible!